The small things we take for granted can make an enormous difference in other people’s lives. That’s why during this Christmas season, Muffin Break is supporting a great cause to help women in need across Australia. 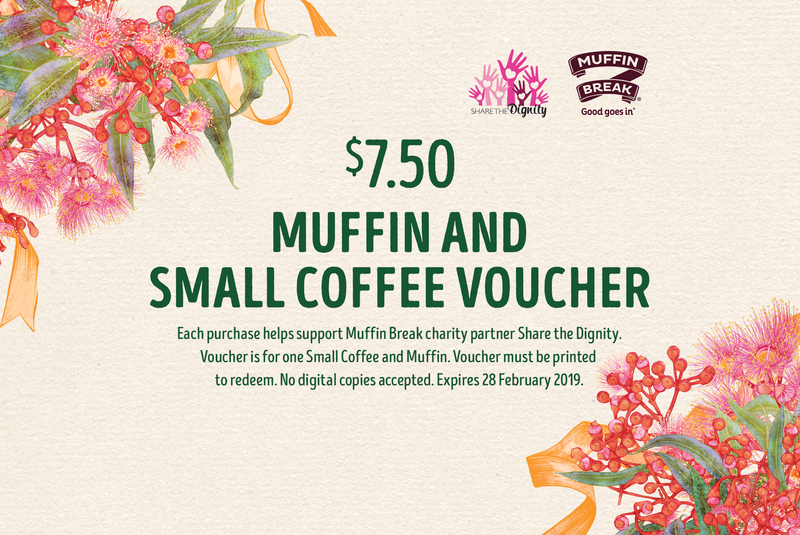 Purchase a Muffin Break voucher for just $7.50 and fifty cents will go directly to our national charity partner Share the Dignity. The $7.50 voucher, available now in our online store, is good for a small coffee and any muffin of your choice. Items like pads and tampons are often luxuries rather than essentials for at-risk women. Share the Dignity founder Rochelle Courtenay came to this realisation one morning as she looked in her bathroom cabinet, and she vowed to make a difference. She filled a handbag with unused toiletries and shared it online. It went viral, and thus her charity’s “It’s in the Bag” initiative was born. Each year, Share the Dignity runs a Christmas driving during which hundreds of thousands of women across Australia donate a handbag with toiletries, similar to Courtenay’s. Share the Dignity’s dedication to at-risk women doesn’t end there. They work all year round to alleviate period poverty. Recently, they were instrumental in persuading the state and federal governments to abolish the Tampon Tax with their #axethetax campaign. Let’s work together to eradicate period poverty this Christmas. Find your nearest Muffin Break.